Thangasseri beach is a 3 kms stretch of silvery sands, located close to Kollam town. The small town of Thangasseri, 5 Kilometers from Kollam, is famous for the beach as well as its historical significance. 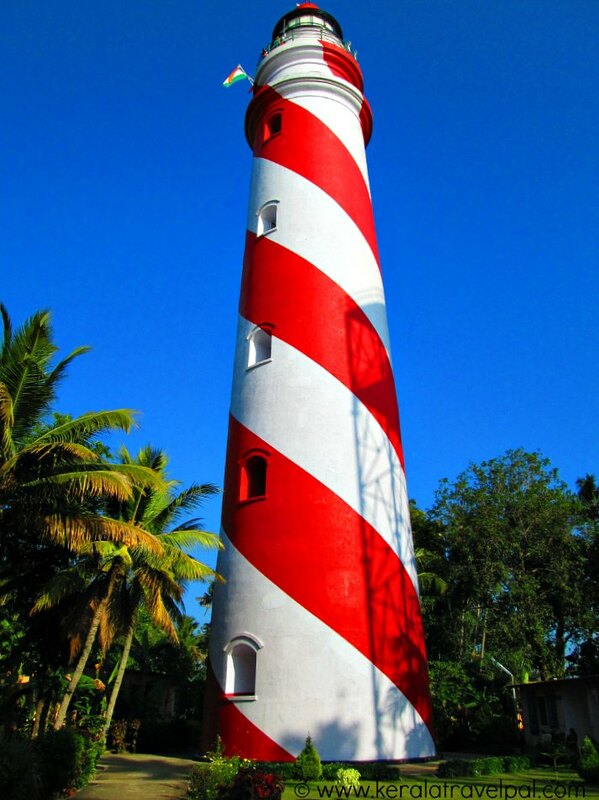 An attraction on the beach is a light house that rise above the surrounding tall coconut palms. Similar to nearby Thirumullavaram beach, Thangasseri is also blessed with calm waves. Many reach here to swim along with the gentle splash. Thangasseri welcomes visitors with a greater range of beach activities, than they experience in most other Kerala beaches. Surfing, scuba diving, catamaran riding and speed boating are the usual reasons to travel to Thangasseri. The beach here is uniformly appealing- those who passively sun bathe like it as much as those who actively venture out for deep sea fishing. The town of Thangasseri boasts a rich historical past. The name itself means village of gold indicating the days when gold was used as a currency and local trade was thriving. Kollam being the cashew capital of Malabar Coast, European powers were often attracted to there. Incidentally, nearby Thangasseri witnessed successive settlements of Portuguese, Dutch and British who were always fond of fighting one another, not so much for fun, but for wealth and power. The stamp of bygone era is still visible in the form ruins of centuries old Portuguese fort. Thangasseri Fort is a historical monument under Archaeological Survey of India. Authorities are contemplating on restoring the last remaining walls to a complete historical building. Thangasseri beach light house was built a century ago to guide fishermen and sailors, along the reef riddled coastal waters. Visitors are permitted to climb to the top of the 144 ft high tower, during the afternoon hours of 3.30 till 5.30. Tower top rejoices spectators with spectacular view of sea and shore. Water forms multiple curves around palm filled land adjoining the sleepy town. Several shops near the beach sell handicraft items and souvenirs. Theme here is coir, coconut materials and sea shells. Handcrafted by local artisans, these articles demonstrate refined ethnic craftsmanship. 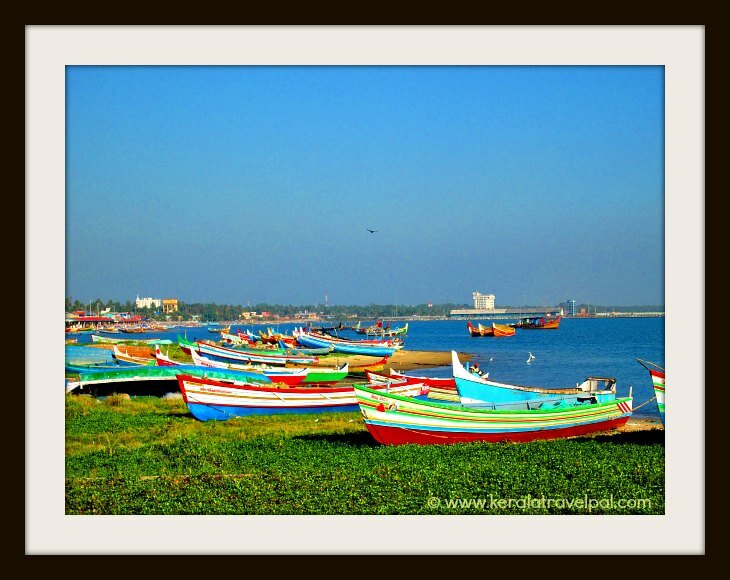 They cast a distinct local feel over those enjoying a beach side Thangasseri tour. Alternatively, you can shop souvenirs from Kollam town. There are also a few beach side eateries, those who fond of kerala snacks can indulge in Vada, Parippu vada, and Pappada Vada and the likes. Budget to luxury accommodations are available at Kollam, for those who intend to spend a few days in this region. Kollam town, the district head quarter, has several shopping precincts and variety of restaurants. Accommodation Options : A range of Hotels and lodges in Kollam town. Nearby Attractions : Kollam town (shopping, food & fun), Kollam Police Museum, Thenmala, Chavara, Sastham Kotta, Thirumullavaram Beach, Ashramam Picnic Village, Jatayu Para, Kottukal Rock Cut Cave Temple, Krishnapuram Palace, Shendurni Wildlife Sanctuary and Matha Amrithanandamayi Ashram.